So 2018 in is full swing, we’re over half way through January already!! How is that even possible?! I’ve been pretty quiet on the old blogging front recently! (well..on my own blog evidently!) I’ve been trying to plan out my posts for the coming weeks but sometimes it’s difficult actually getting the motivation and back in the swing of things after all that busy pre-christmas prep of gift buying, baking and spending time with family! For the most part, I’ve been trying to take care of myself as I had suffered with a couple of colds just before Christmas then the day after boxing day! So self care has been the top of my agenda during this month so far. I love reading other bloggers New Years posts as I find it so inspiring to see what aspirations and goals they have in place for the year ahead. Here are just a few that I’ve enjoyed: Zoe London, She who Bakes & Lisa’s Notebook. One of the first things I had to do was buy a shiny new diary! Now with technology and smartphones, you’d think I’d keep all my notes and bookings for orders in my phone…but no. 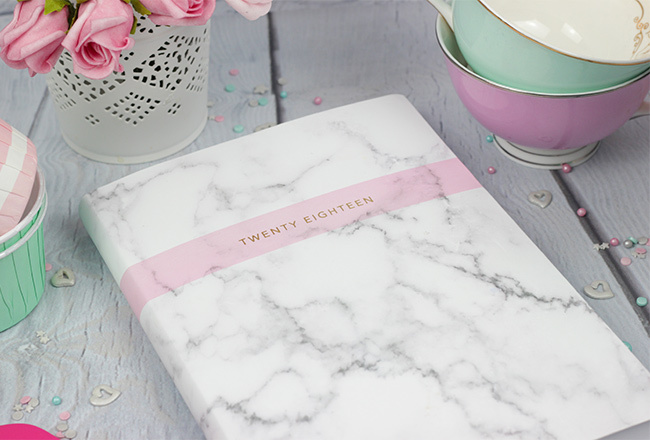 A diary is so much better and works well for me as I can not only write down my plans but draw little designs and ideas along the way. 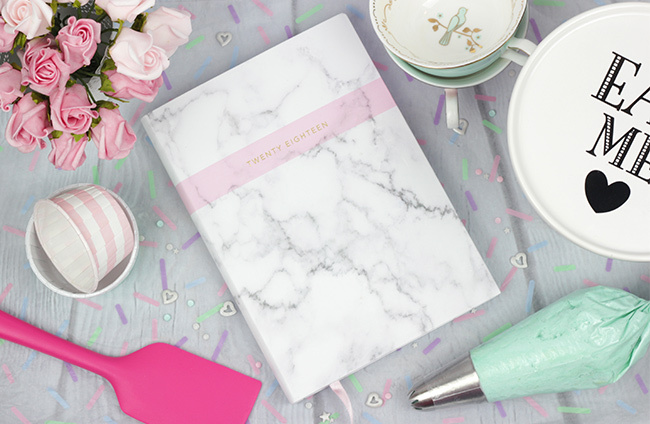 My diary is already getting filled with cake orders! This was an absolute joy to create! The next thing was to sort out my kitchen pantry! I have a walk in cupboard where I keep all my ingredients for baking plus all my cake decorating equipment. This had become a bit of a disorganised mess over the course of 2017 and I decided that it was a New Years Day job so got right on it and chucked out loads of stuff that I didn’t need and found a home for everything! I would love to share how my pantry is organised but that may be a post for another day! Another area I really want to focus on this year is my YouTube Channel! I received an Arkon Mount for Christmas so I’ve been playing around with it over the last week to get the right lighting and such for recipe video’s! I’ve only posted 2 video’s so far so really want to grow my channel in 2018! 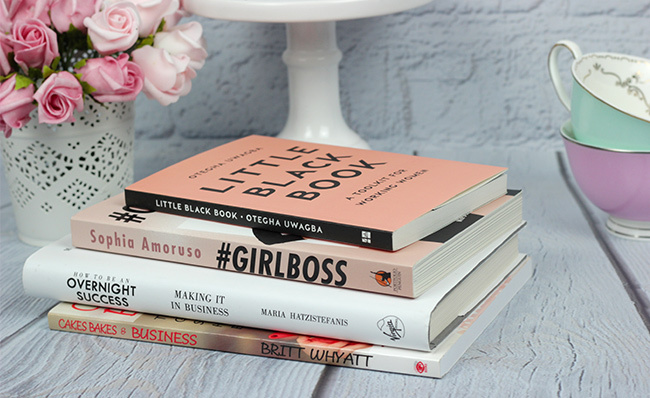 I also want to read more and already have a few books that are at the top of my list including business books. Developing myself and my business is something I really want to focus on this year and really grow. 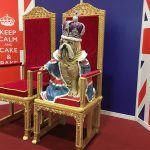 One of my favourite bakers; Britt Whyatt released a baking business book recently which I thought would be a handy read on how to develop and grow my passion in life even more! Plus I also really love a baking book! 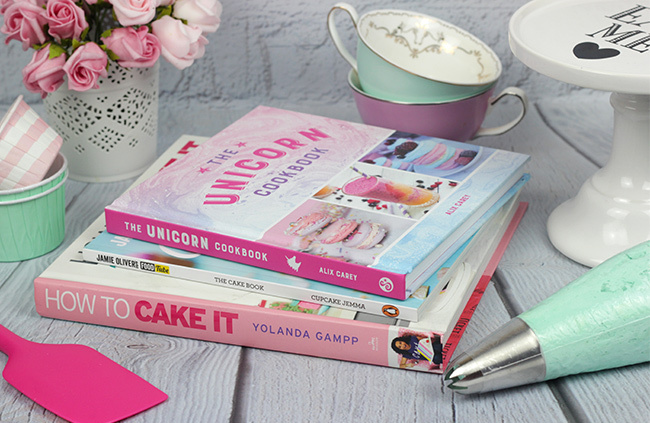 I treated myself to a few including Yolanda Gampp’s first book, The cupcake book by Cupcake Jemma and one of the others I really want to try some recipes from is Alix Carey’s Unicorn Cookbook which I won last year! 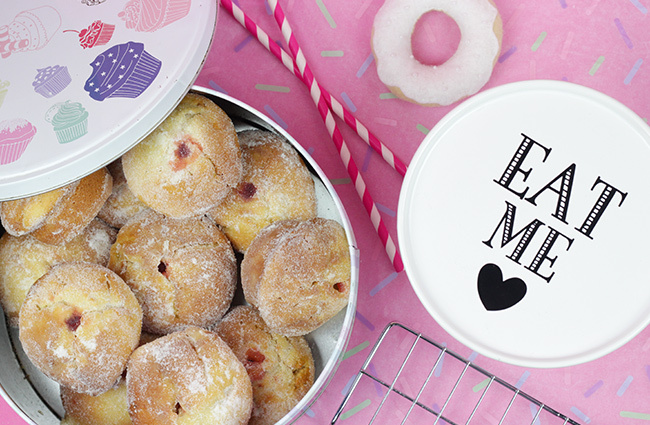 My first post recipe for 2018 is here for these delicious jam doughnut muffins! 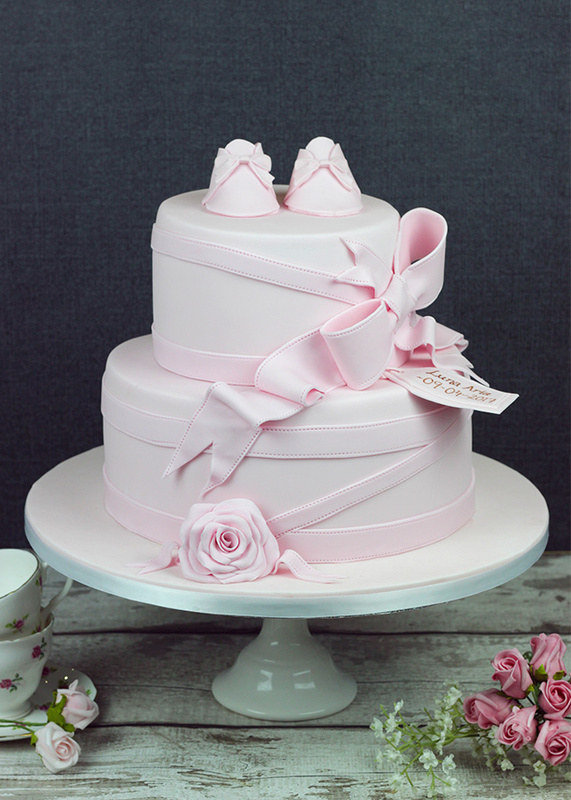 If you haven’t heard about Cake Bag before, I’ll give you a little insight! 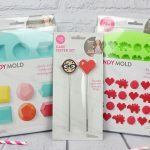 It’s a monthly subscription of baking supplies which includes cake decorating moulds, cutters, stencils and extra treats delivered to your door every month! You can sign up for a one off bag or subscribe to receive one every month! 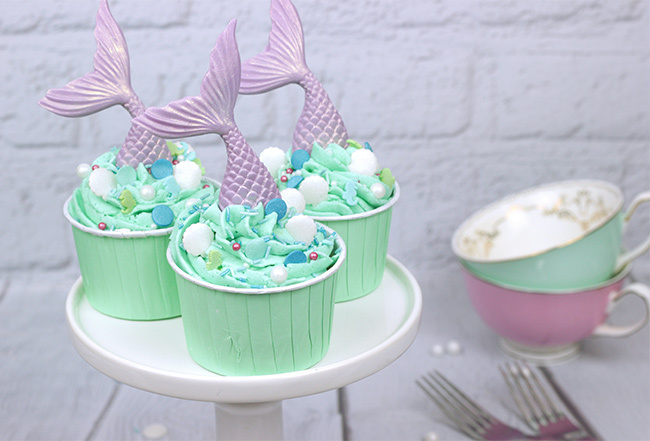 Each month the lovely Rachel comes up with a theme so it can be anything from seasonal products to trends such as unicorns! I write up recipes and tutorials using the products included in each bag to give you ideas of how to use them to create beautiful cakes and bakes at home! 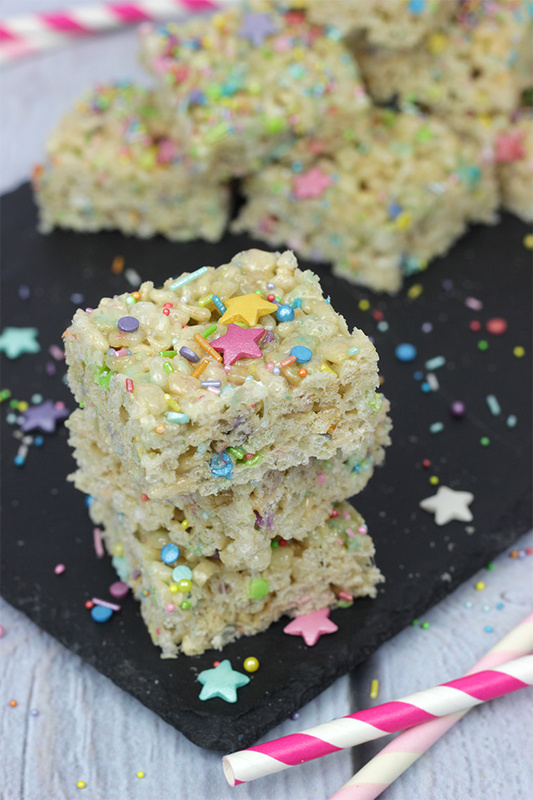 I’ve already written the second post for 2018 for these delicious Sprinkletti Rice Krispy Treats! And of course, I want to continue to write up posts for my own blog which can include anything from recipes & tutorials to reviews and monthly favourites! Have you set any goals or resolutions for 2018?